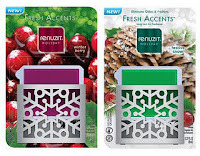 With the holidays right around the corner, what better way to get into the spirit of the season than with some wonderful holiday scented air fresheners! 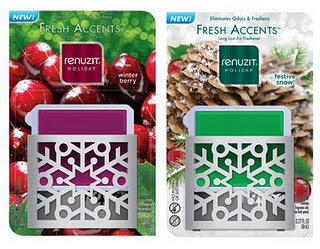 Renuzit Fresh Accents Holiday Air Fresheners come in two delightful holiday scents; Festive Snow and Winter Berry. Their stylish and functional snowflake design is sure to add a touch of the holidays to any room in your home. 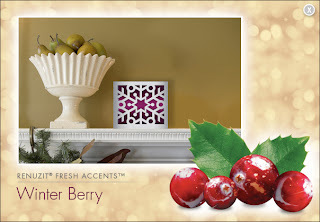 I placed the Winter Berry in our master bedroom and the Festive Snow in our basement family room. Within moments, I could smell the delightful holiday fragrances filling the room. Nearly 3 weeks later, I can still smell them. Renuzit Fresh Accents blends with any home decor. Just remove the gel from the packaging and insert it into the decorative holder for 30 days of continuous fragrance, making them a great value and festive addition to your holiday season. Released nationwide on October 11th, you can purchase them for around $2. Even better try them for FREE by downloading a rebate form! Bring a festive mood to your home this holiday season! I'd get the Snow one, sounds like it would be a clean, crisp scent. I'd love to get winter berry! I would get the winter berry. I think I'd like to try the Winter Berry. I would try the Winter Berry scent. I's really have to smell them - I'm pretty picky. I'd probably go for the Winter Berry, though.